2016 is just around the corner and Ryan, the interns, and I are thinking about things we want to do next year. I'm going to highlight a few of those items real quickly. 1) Android version of TroopTrack Mobile. We've had lots of requests for this. These requests ranged from polite requests to heated demands. We heard you. It's on our list. 2) More features on TroopTrack mobile. We haven't decided exactly what's next, but RSVP'ing for a family member is on the list. We will probably run a poll at some point to help us narrow the list. 3) Subdomains, subdomains, subdomains. We currently support subdomains (ie. troop9.trooptrack.com), but using them is optional and logins are limited to subomains. 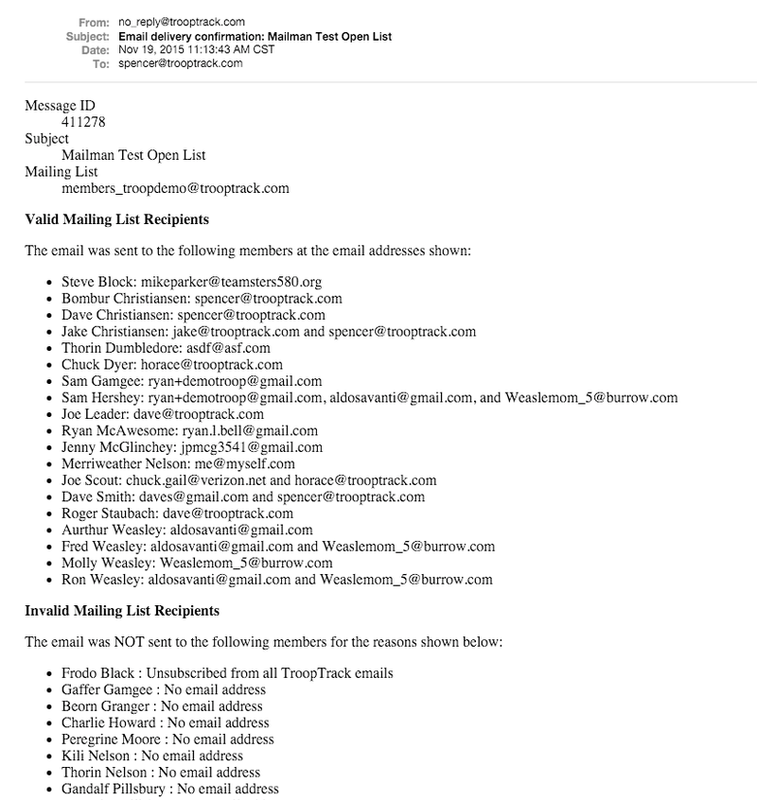 This creates all sorts of problems, such as links in emails not working for people in multiple troops. We're going to make this simple. In the future subdomains will be used at all times and for everything. If you are in Troop 5 and you log in to TroopTrack.com, it will redirect you to troop5.trooptrack.com. If you are a multi-troop user and you switch to Pack 5, you will be redirected to pack5.trooptrack.com. 4) Emoji, why do you hate us!?!?! The number one cause of crashes and failed email deliveries is... emoji characters that aren't supported by our database configuration. People love emoji, and they try to use them everywhere. Unfortunately this crashes in TroopTrack right now because of MySQL's implementation of UTF (if you're not a nerd you probably just totally zoned out). We are going to fix this in 2016. 5) Context sensitive help. We've already started this, but we want to expand this dramatically throughout 2016. We want you to be able to get help directly related to the task you are performing without searching the user guide. 6) Calendaring shouldn't be so complicated. We want to make it simpler, especially recurring events. We want to add the ability to RSVP to events from emails without logging in. Also, we need to add support for manual event payments (this one is critical). 7) Usability improvements, especially in fundraising, money accounts, checklists, and sign up sheets. We want these features to be intuitive and more effective. 8) Public events. Want to sell tickets to a pancake breakfast or organize a regional camp? We want to make it easy for you to do this. 9) Intern level up! We have great interns, and they've been a lifesaver with customer support. We've also been teaching them to program (2 of the changes released this morning were Zach's first contributions to the TroopTrack code). In 2016 we want to help them continue down this path so that we can move even faster, tackle more feature requests, and make TroopTrack a little bit better every single day. Important note: Many of you will want to know when we will ship these features, so I'm going to say this: We don't publish release schedules in advance. Also this: This is what we want to do in 2016 as of this moment. Other things will come up. We may change our minds. We do the best we can and we try to be open about everything, but we can't predict the future reliably. Plans will change, and that's a good thing. Good ole Spencer. He was our very first intern, and he's awesome. 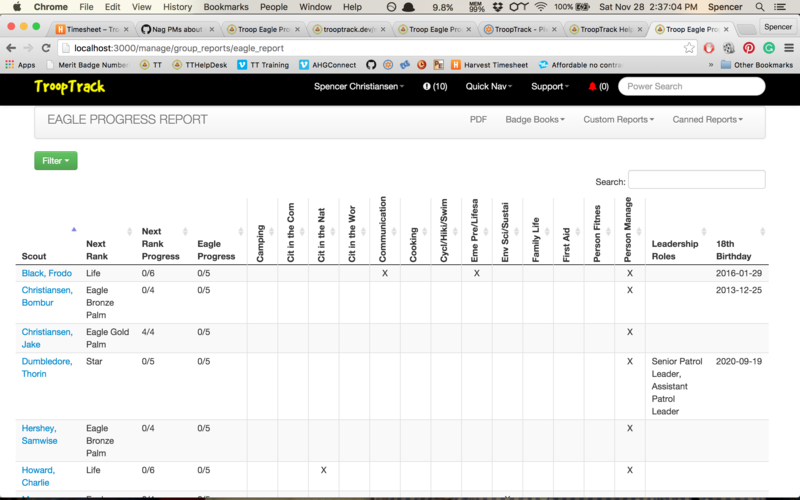 Today we released an update, courtesy of Spencer, that is a big improvement to the Eagle Progress Report. I've attached a before and after picture for you to check out. This is going live even as we speak, so if you try it right away you might get one last glimpse at the old report. TroopTrack customer service operations are CLOSED Thursday, November 26 - Saturday, November 28. We are also closed on Christmas Eve, Christmas Day, New Years Eve, and New Years Day. This morning we are pushing several technical bug fixes that improve performance and reliability, as well as an important change to the den progress report for Cub Scouts. The progress report was showing the old cub ranks by default, and we have updated it to show the new ranks instead. Also, I get a lot of questions about how many photos you can upload to TroopTrack. When I respond with "as many as you want" people are surprised and say something like "that's so generous". I want to clarify something about that. It's not generous. Storage is cheap. Charging you for space is stingy. Let me break down just how cheap it is for you. We pay for the space we use to store photos, for the bandwidth required to upload and download them, and for the server capacity to post-process the photos. We currently store 280,000 photos for our customers. In October, you uploaded 18,627 new photos. Our total bill for all of this for October? $120. Yeah, so... unlimited photo storage isn't generous. It just appears that way because so many products charge for it. Two changes going live this morning, both of them are important, plus a note about customer service. 1) We changed our phone number. We have been having trouble with our phone service (the phone went straight to voicemail 70% of the time!) AND we have been under constant attack from a robo-dialer most evenings. We have updated our contact page with our new phone number. Hopefully the robo-dialer will leave us alone. 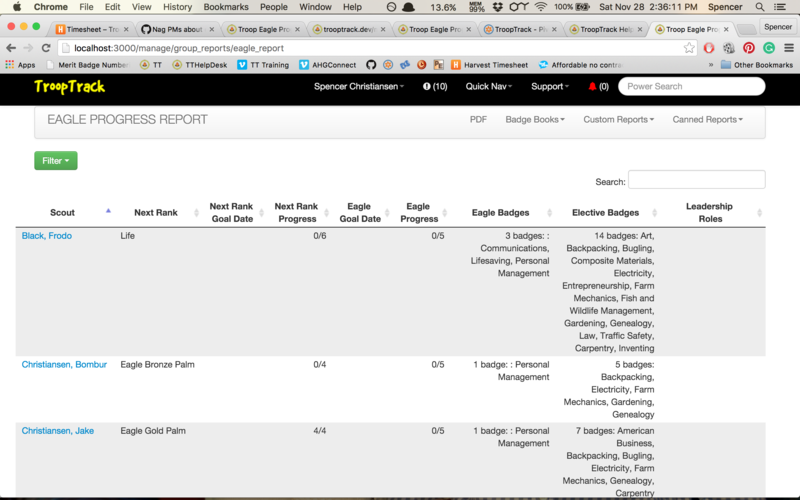 2) Cub scout electives have been hard to use within the bulk awards and individual progress pages. You had to select the rank the electives are associated with, then scroll through all the requirements to find the award you need. We have fixed this - you can now select the award directly. One other quick note... every year, from late July to November 1st, help desk ticket volume increases dramatically. Every fall is a super busy time for us and it's tough for us just to keep up with the questions, let alone fix bugs and implement features. This year we worked really hard to be prepared for the fall. We hired more interns (TroopTrack currently has 11 employees), we refined our support processes, and improved our support tools. That's a lot of customer interaction! This has been our best fall ever in terms of customer support, and I want to say thank you to everyone who made it happen. So... Sam, Wesley, Ryan, Matt, Claire, Reese, Zach, Spencer, Melissa, and Coleman... THANK YOU. Even with all this help, there were a few times when we were totally overwhelmed. We appreciate the patience you exhibited when this happened. We are grateful for all of you who stuck with us while we dug ourselves out of big piles of help desk tickets. It's been hard for us to provide good customer support and deal with all the feature requests we get during the fall flood. Things are starting to slow down now, and as a result we are shifting gears - it may take us a while to get through the 600 feature requests we received between July 15 and November 1, but we are going to get it done. I'm personally very tired, pleased, and anxious to start crushing that big pile of feature requests. But first... I need a break. Shannon and I are leaving town for a week (only the second vacation we've taken with just the two of us EVER). We are excited beyond belief - this time next week we will both have stepped on British soil for the the first time ever! Have a great weekend and thanks for being part of the TroopTrack user community. This morning we deployed a bug fix for bulk transactions that are transfers. If you were transferring from many accounts to one, the bulk transfer was reversing the values and having the opposite effect. This bug is now fixed. Also, coming soon... a new version of the mobile app that includes an easy user search, improvements to uploading avatars, and a placeholder image on the photo uploader page. Some of this information was previously listed on Manage -> Members -> User Accounts. We've removed it from there to avoid confusion. Along with this new feature, we have also fixed a bug for AHG troops where all achievements were not being listed on the Achievement Overview. 1) The "promote" feature on the Manage -> Dens/Patrols/Units/Troops page now separates the youth from the adults and includes "check all" boxes. 2) Importing from AHG Connect will not override the name of the household or the last or first names of your members if you have changed them to differ from AHG Connect. 3) AHG Connect imports now include the joined on date and will set the registered member value for users who are registered. 4) AHG service star calculations will now be performed if you delete service hours. 5) We fixed a bug in the AHG Connect import that was causing girls to not be placed in the appropriate unit for their level. We also worked on improving our PayPal integration to be more reliable, but we aren't quite ready to release it. This has been a challenge to manage over the years, so we have invented ways of dealing with these differences without turning our code into a mess. For example, earlier this year we added the capability to completely customize the way a page looks based on the type of organization you belong to without introducing code similar to the example above. This has been a huge boon for us because it means we can easily roll out unique pages that meet the needs of each organization type we support. We are now working on adding something similar for achievements. We want to be able to apply custom logic to awards like Boy Scout Ranks, AHG Level Awards, etc. For example, we want to be able to tell you when all the required merit badges have been completed, when leadership requirements have been met, etc. And we want to do this without turning our codebase into a complicated, soupy mess. Yesterday I rolled out an experiment with an approach for doing this for AHG troops. All I wanted to accomplish was to display the level awards first on the user profiles. I know that doesn't sound much, but it goes a long way toward verifying the approach. Overall the experiment was a success and it paves the way for us to do much more interesting things going forward. 1) The level awards were listed twice. 2) Requirements for badges were listed on the profile view. Both of these problems have since been fixed. I apologize for the errors, but I am confident that the results of the experiment will lead to significant improvements in the way TroopTrack handles special logic regarding achievements. 1) The new bulk transactions feature wasn't working on the mobile version of TroopTrack.com. This is fixed. 2) We've modified the AHG Connect importer to avoid creating duplicate households.